Chalkup has been redesigned with a simplified interface and enhancements for students and teachers. Chalkup provides chat, messaging, discussion boards and other social tools as an alternative to more structured learning management and collaboration systems. Interface changes were made with the intention of helping users find what they want as they might need it. For example, a new side navigation menu highlights three categories: recent activity, "look ahead" (for upcoming work) and calendar. 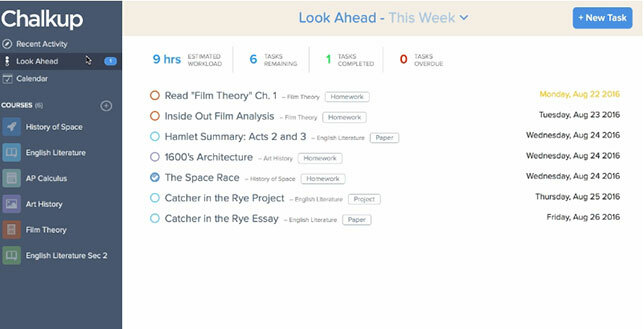 A blue "new task" button on the look-ahead screen allows the student to add an assignment, discussion or material from somewhere else in the program. Students can now personalize the sidebar by dragging and dropping course by whatever order they prefer. Course pages also have a new look to them, navigable by a horizontal menu that allows students to jump between discussions, assignments, materials, grading and classmates. The assignments link shows two views — "What's coming up?" and "Looking Back" for faster access. The materials link shows a list of folders where files may be organized; those include Google Docs, links and videos. Faculty users gain a new "assignments" tab that gives them a countdown for the number of assignments they have left to grade and displays a continually updating class average for a given assignment. A "students" tab on the instructor interface displays student averages, traffic-light color-coded for quick perusal of how individuals are doing in the class. And a "grid" tab displays students and assignments with grades in a matrix format. Updated chat and messaging in the program allows the instructor to send messages to individuals or groups of students from any Internet-enabled device. Although the program is free for faculty and students, a subscription to the Chalkup Pro version adds data imports, a dashboard displaying analytics, a campus-wide notification capability, the capacity for an unlimited number of courses, custom branding and other features.